DC/Warner is desperate to put together a Cinematic Universe like Marvel Studios has done, and to do that, they need to pull together a Justice League. But that’s a tall order: whereas Marvel spent years building up multiple heroes that people wanted to see together or separately, DC has no such solid foundation. Nolan’s Batman trilogy was pretty successful while it lasted, but it left Bats in no shape to continue his career. The latest Superman reboot, on the other hand, was definitely not a success. The Green Lantern movie was even less of one, and the other major Justice League heroes, such as Wonder Woman and The Flash, don’t have any movies at all. This is not an auspicious beginning. 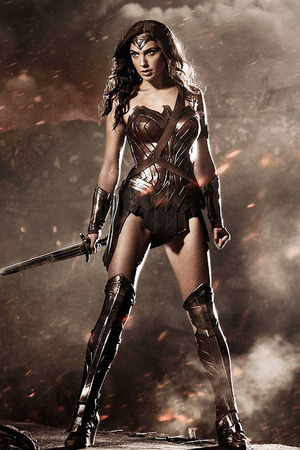 So this movie will serve as Wonder Woman’s introduction. And the signs aren’t good: they’ve cast an Israeli fashion model instead of someone with an athletic build, and they’ve released early pictures of the costume which are just... dammit, it’s brown! So what do they do with this utter lack of credibility they’re starting from? 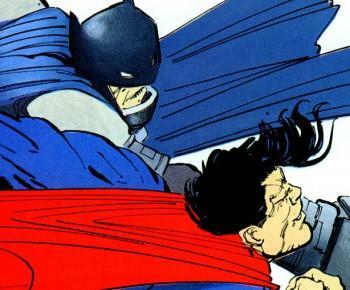 They jump straight to the Batman/Superman showdown from The Dark Knight Returns — a showdown which they haven’t done a damn thing to earn yet. Batman has not yet faced anyone even mildly superpowered on screen before. Zak Snyder is back as the director. It was a mistake to hire him the first time, but they aren’t admitting it — they’re doubling down on every mistake they made the previous time around. And if this isn’t a hit, what’s their backup plan? Suicide Squad! That one is even more unearned. My trainwreck sense is tingling.